A great-value heat press for any new or existing business – This sleek, stylish and ultra-reliable, clam-style heat press is the recommended option for sole traders and smaller businesses, anyone who needs a workhorse of a heat seal press for medium-volume usage or those looking for a longer-term investment in a heat seal press. 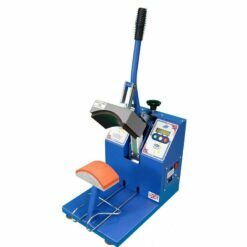 Designed by Stahls’ and proudly built in the USA, the Hotronix Sprint Mag Auto-Open heat press is not only a great value heat press, but offers all of the features you’d expect from a well-built heat press. The Hotronix Sprint Mag Auto Open press has the same great features of the Hotronix MAXX press, but with with an automatic release of the upper platen without the need for an air compressor via a magnet-assisted lock down for maximum productivity with minimal investment. The Hotronix Sprint Mag Auto-Open heat press features the same digital time and temperature controls as MAXX, but with an additional Twin Timer which allows users to set two different time settings. The compact, clam-shell design also allows more space for multiple heat presses which creates optimised application environment. The 15cm x 15cm model is perfect for applying labels, breast pocket designs and shorts. The 28cm x 38cm, 40cm x 40cm and 40cm x 50cm models are perfect for printing larger items, but can also print smaller areas with the wide range of quick-release, interchangeable lower platens which great increase the productivity of the presses. The diamond standard for multi-taskers: With a globally-patented magnetic auto-open feature, it allows the operator to turn away from the press to prepare the next garment or to answer the telephone without worrying about any more ruined garments! Twin Timer: The Hotronix Sprint Mag Auto-Open also features the Twin Timer function which allows the user to set two independent time settings to count down any two-step process, or pre-pressing the garment, without resetting the timer. Over-the-Center Pressure Adjustment to Guarantee Even Heat Pressure: Hotronix heat presses are specifically manufactured with a Stahls’ patented “Over-the-Center” Pressure Adjustment and a floating upper heat platen to ensure even application pressure and a “no-pinch” application regardless of the thickness of the garment. Solid State Temperature Controller for Accurate Heat Reading: In order to maintain an accurate heat, the Sprint MAG Auto-Open upper heat platens are cast in cal-rods which are evenly positioned in a zig-zag pattern throughout the upper platen. Before installation, the heating element is thoroughly x-rayed to ensure its build-quality and maintain the highest levels of accuracy. In addition, all Hotronix Auto-Open heat presses are controlled by a solid-state controller that gives the operator an accurate digital display of both the current temperature and time setting. Wide Opening for Easy Garment Placement: The Hotronix Sprint MAG Auto-Open clam heat presses have a wide 65 degree opening, which is 10% wider than most other clam-style heat presses available in the UK market. This allows for much safer and easier positioning of garments and heat transfers on the lower heat platen prior to applying them. ¾”” thick non-stick coated upper heat press plate.